Alan Dunne struck an extra-time winner as Millwall edged past Wycombe in the Carling Cup first round. Neil Harris slotted the Lions ahead after Wanderers goalkeeper Nikki Bull palmed Danny Schofield's 20-yard shot into his path. Wycombe fought back after the break and they levelled when Ben Strevens side-footed home a Matt Phillips centre. But the visitors restored the lead when Dunne slammed home from close range after being picked out by John Marquis. "In the first-half we stood off them, gave them far too much room and they were able to deliver crosses into our box. "It put us on the back foot but second-half we got closer to them. "We were able to work the ball down the sides which put their back four on the back foot and caused them quite a few problems." 121:03 The referee gets the game started. 118:57 Foul by Ben Strevens (Wycombe) on Danny Schofield (Millwall). Free kick taken right-footed by Darren Ward (Millwall) from own half, passed. 118:14 Defending throw-in by Kevin Betsy (Wycombe). 117:12 Cross by Kevin Betsy (Wycombe), save (caught) by David Forde (Millwall). 116:42 Attacking throw-in by Neil Harris (Millwall). 115:53 Shot by Alan Dunne (Millwall) right-footed from left channel (30 yards), over the bar. 115:34 Goal kick taken long by Nikki Bull (Wycombe). 115:21 Shot by Alan Dunne (Millwall) left-footed from left channel (18 yards), over the bar. 114:30 Goal kick taken long by David Forde (Millwall). 114:06 Shot by Danny Schofield (Millwall) right-footed from right side of penalty area (18 yards), save by Alan Bennett (Wycombe). 113:15 Cross by Andy Sandell (Wycombe), save (caught) by David Forde (Millwall). 112:02 Foul by John Marquis (Millwall) on Leon Johnson (Wycombe). Free kick taken right-footed by Alan Bennett (Wycombe) from own half, passed. 111:22 Attacking throw-in by Kevin Betsy (Wycombe). 110:50 Attacking throw-in by Scott Barron (Millwall). 110:05 Goal kick taken long by David Forde (Millwall). 108:21 Outswinging corner from right by-line taken right-footed by Tamika Mkandawire (Millwall) to near post, foul by Alan Dunne (Millwall) on Alan Bennett (Wycombe). Free kick taken right-footed by Nikki Bull (Wycombe) from own half, resulting in open play. 107:18 Danny Schofield (Millwall) caught offside. Free kick taken right-footed by Nikki Bull (Wycombe) from own half, resulting in open play. 106:40 Goal kick taken long by Nikki Bull (Wycombe). 106:31 Cross by Scott Barron (Millwall), resulting in ball out of play. 106:10 Attacking throw-in by Jack Smith (Millwall). 105:36 Substitution Millwall substitution: James Henry replaced by Chris Hackett (tactical). 105:25 Outswinging corner from right by-line taken right-footed by Matt Phillips (Wycombe) to far post, save (caught) by David Forde (Millwall). 105:00+0:06 GOAL - Alan Dunne:Wycombe 1 - 2 Millwall Goal by Alan Dunne (Millwall) right-footed (bottom-right of goal) from right side of penalty area (18 yards).Wycombe 1-2 Millwall. 104:37 Cross by Kevin Betsy (Wycombe), header by Matt Bloomfield (Wycombe) from left channel (18 yards), missed right. 104:15 Attacking throw-in by Jack Smith (Millwall). 103:34 Attacking throw-in by Scott Barron (Millwall). 103:01 Foul by Lewis Montrose (Wycombe) on John Marquis (Millwall). Free kick taken right-footed by Alan Dunne (Millwall) from own half, resulting in open play. 102:26 Cross by James Henry (Millwall), clearance by Lewis Montrose (Wycombe). 101:21 Foul by Lewis Montrose (Wycombe) on Alan Dunne (Millwall). Free kick taken right-footed by David Forde (Millwall) from own half, resulting in open play. 101:02 Defending throw-in by Kevin Betsy (Wycombe). 100:09 Shot by John Marquis (Millwall) right-footed from right channel (20 yards), save (caught) by Nikki Bull (Wycombe). 99:47 Corner from left by-line taken short right-footed by James Henry (Millwall). 98:55 Neil Harris (Millwall) caught offside. Free kick taken right-footed by Nikki Bull (Wycombe) from own half, resulting in open play. 98:14 Substitution Millwall substitution: Kevin Lisbie replaced by John Marquis (tactical). 97:23 Defending throw-in by Andy Sandell (Wycombe). 96:33 Defending throw-in by Kevin Betsy (Wycombe). 96:15 Attacking throw-in by Kevin Betsy (Wycombe). 95:51 Jon-Paul Pittman (Wycombe) caught offside. Free kick taken right-footed by David Forde (Millwall) from own half, resulting in open play. 95:38 Neil Harris (Millwall) caught offside. Free kick taken right-footed by Nikki Bull (Wycombe) from own half, resulting in open play. 95:16 Foul by Andy Sandell (Wycombe) on Jack Smith (Millwall). Free kick taken right-footed by David Forde (Millwall) from own half, resulting in open play. 94:36 Foul by Neil Harris (Millwall) on Alan Bennett (Wycombe). Free kick taken right-footed by Nikki Bull (Wycombe) from own half, resulting in open play. 94:30 Goal kick taken long by David Forde (Millwall). 94:16 Shot by Matt Phillips (Wycombe) right-footed from right channel (30 yards), missed left. 94:10 Cross by Ben Strevens (Wycombe), clearance by Paul Robinson (Millwall). 92:52 Attacking throw-in by Kevin Betsy (Wycombe). 92:21 Defending throw-in by Scott Barron (Millwall). 91:44 Inswinging corner from left by-line taken right-footed by Matt Phillips (Wycombe) to far post, clearance by Darren Ward (Millwall). 90:42 Goal kick taken long by Nikki Bull (Wycombe). 90:00+4:52 Defending throw-in by Andy Sandell (Wycombe). 90:00+3:31 Goal kick taken long by David Forde (Millwall). 90:00+2:57 Attacking throw-in by Jack Smith (Millwall). 90:00+2:24 Attacking throw-in by James Henry (Millwall). 90:00+1:28 Attacking throw-in by Danny Schofield (Millwall). 88:36 Cross by Matt Phillips (Wycombe), clearance by Jack Smith (Millwall). 87:48 Attacking throw-in by Scott Barron (Millwall). 87:13 Inswinging corner from right by-line taken left-footed by Scott Barron (Millwall) to far post, save (punched) by Nikki Bull (Wycombe). 86:41 Defending throw-in by Scott Barron (Millwall). 86:11 Attacking throw-in by Marvin McCoy (Wycombe). 85:56 Defending throw-in by Marvin McCoy (Wycombe). 85:33 Defending throw-in by Marvin McCoy (Wycombe). 85:07 Kevin Betsy (Wycombe) caught offside. Free kick taken right-footed by David Forde (Millwall) from own half, resulting in open play. 84:38 Foul by Kevin Lisbie (Millwall) on Alan Bennett (Wycombe). Free kick taken right-footed by Nikki Bull (Wycombe) from own half, resulting in open play. 83:57 Foul by Jon-Paul Pittman (Wycombe) on Scott Barron (Millwall). Free kick taken right-footed by David Forde (Millwall) from own half, resulting in open play. 83:47 Cross by Andy Sandell (Wycombe), resulting in ball out of play. 82:49 Defending throw-in by Marvin McCoy (Wycombe). 82:08 Neil Harris (Millwall) caught offside. Free kick taken right-footed by Matt Bloomfield (Wycombe) from own half, passed. 81:35 Attacking throw-in by Neil Harris (Millwall). 79:19 Inswinging corner from left by-line taken right-footed by James Henry (Millwall) to near post, clearance by Matt Phillips (Wycombe). 78:52 Inswinging corner from left by-line taken right-footed by James Henry (Millwall) to centre, clearance by Nikki Bull (Wycombe). 78:35 Corner from left by-line taken short right-footed by James Henry (Millwall). 78:08 Shot by Neil Harris (Millwall) left-footed from left side of penalty area (12 yards), save (caught) by Nikki Bull (Wycombe). 77:52 Cross by Matt Phillips (Wycombe), clearance by Paul Robinson (Millwall). 77:26 Attacking throw-in by Marvin McCoy (Wycombe). 76:56 Foul by Matt Bloomfield (Wycombe) on Danny Schofield (Millwall). Free kick taken left-footed by Scott Barron (Millwall) from own half, passed. 75:58 Assist (cross) by Matt Phillips (Wycombe) from right side of penalty area. 75:58 GOAL - Ben Strevens:Wycombe 1 - 1 Millwall Goal by Ben Strevens (Wycombe) right-footed (top-right of goal) from right side of penalty area (6 yards).Wycombe 1-1 Millwall. 75:25 Danny Schofield (Millwall) caught offside. Free kick taken right-footed by Nikki Bull (Wycombe) from own half, resulting in open play. 74:18 Defending throw-in by Scott Barron (Millwall). 73:57 Attacking throw-in by Marvin McCoy (Wycombe). 73:44 Attacking throw-in by Marvin McCoy (Wycombe). 72:57 Attacking throw-in by Marvin McCoy (Wycombe). 71:36 Foul by Kevin Betsy (Wycombe) on Alan Dunne (Millwall). Free kick taken right-footed by Danny Schofield (Millwall) from left channel (30 yards), hit wall. 71:18 Attacking throw-in by Scott Barron (Millwall). 70:41 Goal kick taken long by Nikki Bull (Wycombe). 69:49 Substitution Millwall substitution: Marc Laird replaced by Alan Dunne (tactical). 69:18 Substitution Wycombe substitution: Scott Rendell replaced by Ben Strevens (tactical). 69:01 Defending throw-in by Scott Barron (Millwall). 68:33 Foul by Tamika Mkandawire (Millwall) on Scott Rendell (Wycombe). Free kick taken left-footed by Kevin Betsy (Wycombe) from left channel, passed. 68:05 Cross by Matt Bloomfield (Wycombe), clearance by Scott Barron (Millwall). 67:41 Attacking throw-in by Andy Sandell (Wycombe). 67:07 Goal kick taken long by David Forde (Millwall). 67:00 Cross by Jon-Paul Pittman (Wycombe), resulting in ball out of play. 66:43 Cross by James Henry (Millwall), resulting in open play. 66:14 Cross by Matt Phillips (Wycombe), save (caught) by David Forde (Millwall). 65:42 Defending throw-in by Scott Barron (Millwall). 65:15 Defending throw-in by Scott Barron (Millwall). 64:58 Cross by Scott Barron (Millwall), save (caught) by Nikki Bull (Wycombe). 64:13 Foul by Lewis Montrose (Wycombe) on Marc Laird (Millwall). Free kick taken right-footed by Jack Smith (Millwall) from own half, resulting in open play. 64:01 Defending throw-in by Jack Smith (Millwall). 63:37 Substitution Wycombe substitution: Kieran Murtagh replaced by Matt Bloomfield (tactical). 62:31 Attacking throw-in by Danny Schofield (Millwall). 62:03 Shot by Lewis Montrose (Wycombe) right-footed from right channel (30 yards), save (caught) by David Forde (Millwall). 61:56 Cross by Matt Phillips (Wycombe), clearance by Tamika Mkandawire (Millwall). 60:58 Goal kick taken long by Nikki Bull (Wycombe). 60:34 Attacking throw-in by Andy Sandell (Wycombe). 60:18 Outswinging corner from right by-line taken right-footed by Matt Phillips (Wycombe) to far post, clearance by Tamika Mkandawire (Millwall). 59:48 Substitution Wycombe substitution: Danny Foster replaced by Andy Sandell (tactical). 58:48 Foul by Danny Schofield (Millwall) on Marvin McCoy (Wycombe). Free kick taken right-footed by Marvin McCoy (Wycombe) from own half, passed. 58:33 Cross by Scott Barron (Millwall), clearance by Lewis Montrose (Wycombe). 57:14 Goal kick taken long by David Forde (Millwall). 56:47 Goal kick taken long by Nikki Bull (Wycombe). 55:46 Foul by Alan Bennett (Wycombe) on Kevin Lisbie (Millwall). Free kick taken right-footed by James Henry (Millwall) from left channel (30 yards), over the bar. 55:29 Goal kick taken long by David Forde (Millwall). 55:04 Outswinging corner from right by-line taken right-footed by Matt Phillips (Wycombe) to far post, resulting in ball out of play. 54:46 Attacking throw-in by Marvin McCoy (Wycombe). 53:39 Attacking throw-in by Scott Barron (Millwall). 53:20 Defending throw-in by Marvin McCoy (Wycombe). 52:48 Goal kick taken long by Nikki Bull (Wycombe). 52:08 Shot by Danny Foster (Wycombe) right-footed from left channel (25 yards), save (caught) by David Forde (Millwall). 51:53 Defending throw-in by Marvin McCoy (Wycombe). 51:29 Foul by Danny Schofield (Millwall) on Matt Phillips (Wycombe). Free kick taken right-footed by Nikki Bull (Wycombe) from own half, resulting in open play. 51:08 Attacking throw-in by Scott Barron (Millwall). 50:57 Defending throw-in by Marvin McCoy (Wycombe). 50:27 Shot by James Henry (Millwall) right-footed from right channel (30 yards), save (caught) by Nikki Bull (Wycombe). 49:50 Shot by Kevin Betsy (Wycombe) left-footed from left channel (25 yards), missed left. 48:59 Attacking throw-in by Kevin Betsy (Wycombe). 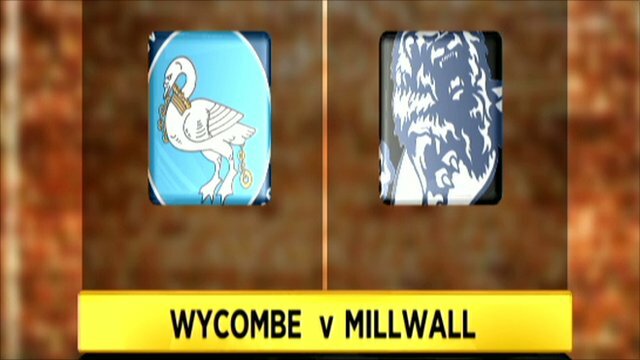 48:50 Cross by Matt Phillips (Wycombe), save (punched) by David Forde (Millwall). 48:31 Attacking throw-in by Marvin McCoy (Wycombe). 48:04 Defending throw-in by Marvin McCoy (Wycombe). 46:43 Outswinging corner from right by-line taken right-footed by Matt Phillips (Wycombe) to near post, clearance by Neil Harris (Millwall). 46:17 Attacking throw-in by Matt Phillips (Wycombe). 45:05 Attacking throw-in by Marvin McCoy (Wycombe). 45:00+1:46 Cross by Scott Barron (Millwall), clearance by Alan Bennett (Wycombe). 45:00+0:23 Foul by Alan Bennett (Wycombe) on Kevin Lisbie (Millwall). Free kick taken right-footed by Darren Ward (Millwall) from own half, resulting in open play. 44:15 Booking Tamika Mkandawire (Millwall) booked for unsporting behaviour. 43:32 Foul by Tamika Mkandawire (Millwall) on Scott Rendell (Wycombe). Free kick taken right-footed by Alan Bennett (Wycombe) from own half, resulting in open play. 43:13 Kevin Lisbie (Millwall) caught offside. Free kick taken right-footed by Nikki Bull (Wycombe) from own half, passed. 43:05 Cross by James Henry (Millwall), save (caught) by Nikki Bull (Wycombe). 42:33 Corner from right by-line taken short right-footed by Neil Harris (Millwall). 42:14 Attacking throw-in by Jack Smith (Millwall). 41:58 Goal kick taken long by David Forde (Millwall). 41:49 Cross by Matt Phillips (Wycombe), resulting in ball out of play. 41:23 Outswinging corner from right by-line taken right-footed by Kieran Murtagh (Wycombe) to far post, resulting in open play. 41:14 Cross by Marvin McCoy (Wycombe), save (punched) by David Forde (Millwall). 40:49 Attacking throw-in by Marvin McCoy (Wycombe). 40:10 Defending throw-in by Danny Foster (Wycombe). 39:22 Attacking throw-in by Jack Smith (Millwall). 39:09 Attacking throw-in by Neil Harris (Millwall). 39:04 Cross by Neil Harris (Millwall), clearance by Leon Johnson (Wycombe). 38:47 Attacking throw-in by Neil Harris (Millwall). 38:16 Cross by Scott Barron (Millwall), save (caught) by Nikki Bull (Wycombe). 37:43 Shot by Kevin Betsy (Wycombe) right-footed from left channel (25 yards), save (caught) by David Forde (Millwall). 36:28 Cross by Danny Schofield (Millwall), clearance by Danny Foster (Wycombe). 36:03 Cross by James Henry (Millwall), clearance by Kieran Murtagh (Wycombe). 35:41 Foul by Lewis Montrose (Wycombe) on Marc Laird (Millwall). Free kick taken right-footed by Marc Laird (Millwall) from own half, passed. 35:07 Goal kick taken long by David Forde (Millwall). 34:11 Foul by Paul Robinson (Millwall) on Kevin Betsy (Wycombe). Free kick taken right-footed by Matt Phillips (Wycombe) from left wing (20 yards), over the bar. 33:28 Defending throw-in by Jack Smith (Millwall). 32:49 Foul by Kevin Lisbie (Millwall) on Leon Johnson (Wycombe). Free kick taken left-footed by Leon Johnson (Wycombe) from own half, resulting in open play. 32:27 Defending throw-in by Jack Smith (Millwall). 32:10 Foul by Kevin Lisbie (Millwall) on Leon Johnson (Wycombe). Free kick taken left-footed by Leon Johnson (Wycombe) from own half, passed. 31:50 Defending throw-in by Marvin McCoy (Wycombe). 31:31 Defending throw-in by Marvin McCoy (Wycombe). 30:33 Defending throw-in by James Henry (Millwall). 29:45 Attacking throw-in by Jack Smith (Millwall). 29:21 Defending throw-in by Danny Foster (Wycombe). 28:44 Attacking throw-in by Danny Foster (Wycombe). 27:49 Attacking throw-in by Scott Barron (Millwall). 27:30 Cross by Neil Harris (Millwall), save (caught) by Nikki Bull (Wycombe). 26:47 Defending throw-in by Marvin McCoy (Wycombe). 26:17 Foul by Matt Phillips (Wycombe) on Scott Barron (Millwall). Free kick taken right-footed by David Forde (Millwall) from own half, resulting in open play. 25:08 GOAL - Neil Harris:Wycombe 0 - 1 Millwall Goal by Neil Harris (Millwall) right-footed (low centre of goal) from right side of six-yard box (6 yards).Wycombe 0-1 Millwall. 24:38 Shot by Danny Schofield (Millwall) left-footed from left side of penalty area (18 yards), save (parried) by Nikki Bull (Wycombe). 23:58 Shot by Scott Barron (Millwall) left-footed from left side of penalty area (18 yards), save (caught) by Nikki Bull (Wycombe). 23:33 Defending throw-in by Jack Smith (Millwall). 22:49 Goal kick taken long by David Forde (Millwall). 21:45 Goal kick taken long by Nikki Bull (Wycombe). 20:30 Defending throw-in by Danny Foster (Wycombe). 19:55 Cross by James Henry (Millwall), clearance by Danny Foster (Wycombe). 19:08 Goal kick taken long by Nikki Bull (Wycombe). 18:20 Cross by Danny Schofield (Millwall), clearance by Lewis Montrose (Wycombe). 18:13 Attacking throw-in by Danny Schofield (Millwall). 17:37 Inswinging corner from left by-line taken right-footed by James Henry (Millwall) to near post, save (punched) by Nikki Bull (Wycombe). 17:30 Cross by Jack Smith (Millwall), resulting in ball out of play. 16:47 Foul by Kieran Murtagh (Wycombe) on Tamika Mkandawire (Millwall). Free kick taken right-footed by Tamika Mkandawire (Millwall) from left channel, passed. 16:06 Shot by Kevin Lisbie (Millwall) right-footed from left channel (20 yards), save (caught) by Nikki Bull (Wycombe). 15:37 Goal kick taken long by Nikki Bull (Wycombe). 14:31 Outswinging corner from right by-line taken right-footed by James Henry (Millwall) to near post, clearance by Matt Phillips (Wycombe). 14:08 Attacking throw-in by Jack Smith (Millwall). 13:27 Goal kick taken long by Nikki Bull (Wycombe). 13:14 Attacking throw-in by Scott Barron (Millwall). 12:52 Shot by Jack Smith (Millwall) left-footed from left channel (25 yards), save (caught) by Nikki Bull (Wycombe). 12:24 Foul by Lewis Montrose (Wycombe) on James Henry (Millwall). Free kick taken right-footed by Tamika Mkandawire (Millwall) from right channel, passed. 12:00 Neil Harris (Millwall) caught offside. Free kick taken right-footed by Nikki Bull (Wycombe) from own half, resulting in open play. 11:43 Jon-Paul Pittman (Wycombe) caught offside. Free kick taken right-footed by David Forde (Millwall) from own half, resulting in open play. 10:39 Cross by Kieran Murtagh (Wycombe), save (caught) by David Forde (Millwall). 10:02 Foul by Paul Robinson (Millwall) on Scott Rendell (Wycombe). Free kick taken right-footed by Kevin Betsy (Wycombe) from left channel, passed. 9:34 Goal kick taken long by Nikki Bull (Wycombe). 8:45 Goal kick taken long by Nikki Bull (Wycombe). 8:10 Outswinging corner from right by-line taken right-footed by James Henry (Millwall) to near post, clearance by Kieran Murtagh (Wycombe). 7:41 Attacking throw-in by Jack Smith (Millwall). 7:05 Goal kick taken long by David Forde (Millwall). 6:40 Attacking throw-in by Marvin McCoy (Wycombe). 6:16 Defending throw-in by Scott Barron (Millwall). 5:31 Goal kick taken long by Nikki Bull (Wycombe). 5:24 Cross by Scott Barron (Millwall), resulting in ball out of play. 5:03 Attacking throw-in by Scott Barron (Millwall). 3:00 Cross by Kieran Murtagh (Wycombe), clearance by Jack Smith (Millwall). 2:29 Defending throw-in by Marvin McCoy (Wycombe). 2:03 Cross by Kieran Murtagh (Wycombe), save (caught) by David Forde (Millwall). 1:39 Foul by Scott Barron (Millwall) on Kieran Murtagh (Wycombe). Free kick taken right-footed by Scott Rendell (Wycombe) from right channel, passed. 1:21 Attacking throw-in by Marvin McCoy (Wycombe). 0:53 Foul by Tamika Mkandawire (Millwall) on Matt Phillips (Wycombe). Free kick taken right-footed by Kevin Betsy (Wycombe) from left wing, passed. 0:47 Attacking throw-in by Danny Foster (Wycombe). Extra time ends and the match is over.